Click 'OK' to Continue or 'Cancel' to choose later. 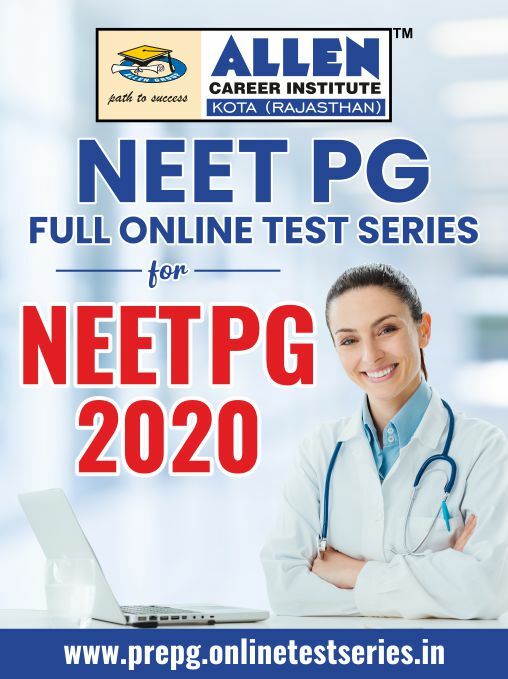 ALLEN's NEET-PG Full Online Test Series is a real-time testing and assessment platform, which is intended to provide aspirants a meticulously designed test preparation material of NEET-PG (MD/MS Entrance) exam. These model question papers are prepared by our faculty experts based on research and experience keeping in mind the latest pattern and syllabus with an aim to give an actual simulation of target exam, comprehensive review of your answers and overall performance analysis, helping individuals with self evaluation to concentrate on respective subjects/the areas where you need to work more and improve on. It also facilitates students to compare their results with other candidates across the nation. Kick-start your NEET PG exam preparation and have the finest learning experience. 2.Cumulative Test Pattern (150 Questions, 600 Marks, 105 min). 3.Major Test Pattern (300 Questions, 1200 Marks, 210 min). 4.All Test Will be closed on 10/01/2020. Register Free by clicking here. Activate your Account by following the mail sent on your registered Email. Visit this page again and click on "Buy Now". Follow the CHECKOUT process and complete the purchase after choosing an appropriate Payment Mode. After completing the Purchase, either upload your Photo & Signature OR download, print and send us completed Declaration Form from here.